Venlafaxine and desvenlafaxine can cause delayed onset seizures. There is also a risk of serotonin toxicity in overdose. There are active metabolites, so symptoms can be prolonged. Benzodiazepines are the first line treatment to manage seizures. Venlafaxine (Effexor®) is a popular medication used to treat numerous conditions such as depression, generalized anxiety disorder, panic disorder, diabetic peripheral neuropathy, and post-traumatic stress disorder. Desvenlafaxine (Pristiq® and Khedezla®) is the major metabolite of venlafaxine and is considered equipotent. The Missouri Poison Center has been monitoring venlafaxine and desvenlafaxine overdoses and has recognized the possibility of delayed onset seizures after overdose. In addition, these overdoses can cause significant toxicity, including some cardiac symptoms that you may not expect. Venlafaxine and desvenlafaxine are serotonin norepinephrine reuptake inhibitors (SNRIs) along with milnacipran (Savella®), levomilnacipran (Fetzima®), and duloxetine (Cymbalta®). Overall, SNRIs inhibit the reuptake of neuronal serotonin, norepinephrine, and to a lesser extent, dopamine. In overdose, this causes excessive neurotransmitter activity in the CNS. Venlafaxine and desvenlafaxine are considered strongly serotonergic and more likely to induce serotonin toxicity, especially in the presence of other serotonergic agents. In contrast to other SNRIs, in very high dose they also block sodium and potassium channels, which can set the stage for a cardiac arrhythmia. As a result, these two SNRIs are considered to be more toxic than the others. Venlafaxine comes in immediate and extended release capsules of varying strengths. Immediate-release capsules reach peak blood concentration in 2 hours, while extended-release capsules reach the peak in 5.5 hours. Venlafaxine half-life ranges from 3-7 hours, but its major metabolite is equally active and has a longer half-life of 9-13 hours, so adverse effects can be prolonged. Desvenlafaxine, the active metabolite marketed as a different product, is available only in extended release capsules that reach peak concentration in 7.5 hours. In small dosing mistakes or minor overdoses, symptoms may include nausea, vomiting, anorexia, drowsiness, slight tremor, anxiety, tachycardia, and modest changes in blood pressure. Large overdoses, usually intentional, may produce mental status changes, delirium, seizures, and coma. Overdose greater than 8 grams of venlafaxine may cause slowed cardiac conduction and risk of ventricular dysrhythmia due to sodium and potassium channel block. Because these agents are strongly serotonergic, overdose may result in serotonin toxicity that can range from mild to severe (see figure below). Serotonin-induced excessive muscle activity can lead to elevated serum CK and frank rhabdomyolysis. Venlafaxine and desvenlafaxine can cause seizures in therapeutic dosing, albeit rarely, and the risk is magnified in overdose. 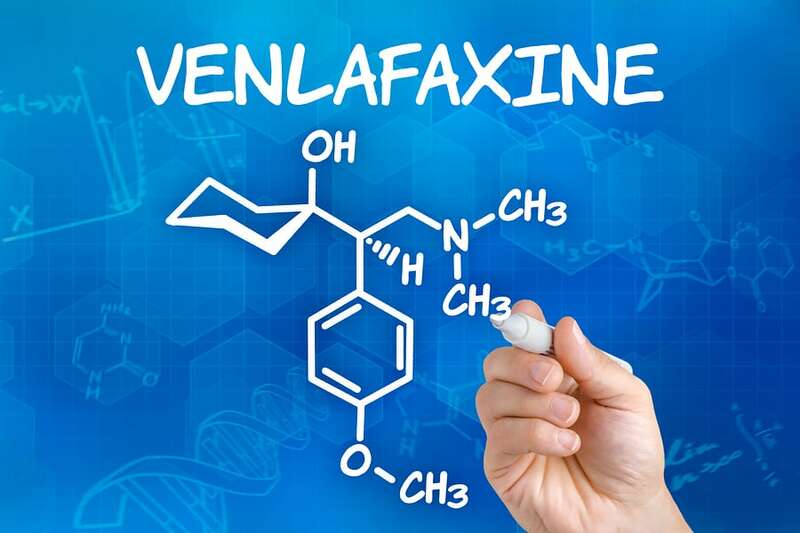 There are several case series published in the literature where venlafaxine ranks fairly high as one of the common causes of drug-induced seizures. It is important to know that seizures may be delayed hours after the ingestion. Missouri Poison Center has followed cases where seizures have occurred up to 8-12 hours after the ingestion. Why would this be? After venlafaxine reaches peak serum concentration its active metabolite, O-desmethylvenlafaxine (ODV) continues to be formed. It doesn’t reach its peak for several more hours (3 -9 hours depending on immediate-release or extended-release formulation). Furthermore, since ODV half-life is longer (9-13 hours), it will gradually accumulate to an even greater degree. Eventually after overdose the blood concentrations of parent drug and active metabolite can rise into a range that is risky for seizures, and will stay in that range for some time. Thus, side effects including seizures can be delayed in onset and prolonged or recurrent. It is not fully known how venlafaxine and desvenlafaxine induce seizures, but it is likely due its effects on multiple neurotransmitters important in seizure genesis and extinction. It is also interesting to note that venlafaxine’s chemical structure is very similar to tramadol, which commonly causes seizures in overdose. Laboratory monitoring for patients with venlafaxine overdose include routine metabolic panel and creatinine kinase, along with a 12-lead EKG and continuous cardiac monitoring. Of note, venlafaxine can cause a false-positive for PCP or amphetamines on some urine drug screens. SEIZURES: If seizures occur, treat with a benzodiazepine as first line. If seizures persist, add levetiracetam, and then phenobarbital or propofol, if necessary. General anesthesia with propofol may be necessary if seizures remain uncontrolled. CARDIAC EFFECTS: A widened QRS is treated with sodium bicarbonate; however, a prolonged QT needs no treatment. Keep the patient under continuous cardiac monitoring, obtain serial EKGs and keep serum potassium and magnesium in the high normal range. Follow ACLS protocols for any arrhythmias that occur. SEROTONIN TOXICITY: Mild serotonin toxicity that causes no distress to the patient does not need treatment. For moderate or severe symptoms, start with a benzodiazepine. Add a serotonin antagonist, cyproheptadine (oral) or chlorpromazine (IV), for persistent or progressive symptoms. Supportive care should include cooling measures and hydration, and move to sedation, paralysis, and intubation if needed. Hemodialysis is not an option for venlafaxine due to a large volume of distribution. Venlafaxine and desvenlafaxine overdoses can be challenging to manage and symptoms may become severe. Our advice to you is to call the Missouri Poison Center. Our specially trained nurses, pharmacists and medical toxicologist can provide you with the most up-to-date treatment advice on venlafaxine and other SNRI exposures.